We are gathered here to remember the brave men and women who gave their lives for the cause of Tibet fifty-six years ago. We are also gathered here to remind ourselves to carry forward the non-violent struggle of the Tibetan people with great determination, courage and resolve. My fellow Tibetans, I report to you that the situation in Tibet remains grim but the enduring spirit of Tibetan people is strong and getting stronger. Ever since the 2008 peaceful protests erupted, and the ongoing self-immolation protests throughout the plateau, Tibet is under virtual lockdown. Restrictions on movements of Tibetans have greatly intensified. At multiple checkpoints in major urban centers under constant surveillance cameras, Tibetans must swipe their identity cards that are embedded with sophisticated second generation chips. As one Tibetan has described this indignity: “Your identity card is like your shadow. Without it you cannot move.” The situation of increased restrictions is so excessive that even Chinese tourists have been moved to comment that the present conditions in Tibet are like a ‘war zone’. Of particular concern to Tibetans is the China State Council’s announcement in 2014 to upgrade the status of the towns of Shigatse and Chamdo to that of cities. Though Tibetans welcome economic development in the form of modernization, their experience in the face of urbanization is one of economic marginalization, social exclusion and environmental destruction. Lhasa is a prime example. The city has seen an exponential urban expansion that has attracted migrant Chinese workers from all over China. This population shift has transformed the heart of Tibetan culture into another “Chinatown”, where Tibetans live in small ghettos surrounded by an expanding urban China. We fear the same negative transformation will happen to Shigatse and Chamdo, immeasurably reducing the ability of the Tibetan people to preserve their culture and identity. At the same time, Tibetans equally fear that Chinese settlers will overwhelm and swamp rural and nomadic Tibet. These are some of the many challenges we confront in Tibet. Yet I believe that we have the determination, resolve and the collective will to surmount them. Tibetans in Tibet have survived one state-sponsored disaster after another. Disasters like the Great Leap Forward in the 1950s and the Cultural Revolution in the 1960s have not shaken the enduring spirit of the Tibetan people. From the martial law imposed in Lhasa in 1989, to the “strike hard campaigns” to stifle dissent, and campaigns like the Western China Development programme have not diminished the courage of the Tibetan people. From the 1959 uprising, which we honor today, through the decades of peaceful protests, including the 2008 pan-Tibet demonstrations and more than one hundred self-immolations, the Tibetan will to live as one cohesive people and fight for justice remains firm. In Tibet, artists sing, paint and write, all with an emboldened spirit and a heightened sense of responsibility to the Tibetan cause. Within Tibet, a new spiritual, cultural and intellectual renaissance reinforces Tibetan pride and unity. From the humble gatherers of dbyar rtswa dgun ‘bu (caterpillar fungus) to the tireless truck drivers, farmers and nomads, to monks and nuns, Tibetans talk the night away in common aspiration to live in dignity and with a common identity. These pockets of ideas and oases of Tibet’s common aspirations will merge into a bright future for all people of Tibet. The rhetoric coming out of China today is that Tibetans have become their own masters. To make this rhetoric a reality, we urge the Chinese leadership to let Tibetans govern Tibet. As China plans to observe the 50th anniversary of the so-called Tibet Autonomous Region (TAR), hardliners in Beijing should heed that repression will only generate resentment. We have noted President Xi Jinping’s comments that Tibetan culture and language should be preserved yet, the local authority’s 20-point internal directives in Amdo undermines both. On the part of the Kashag, we remain fully committed to the Middle Way Approach of not seeking separation from China but genuine autonomy for the Tibetan people. 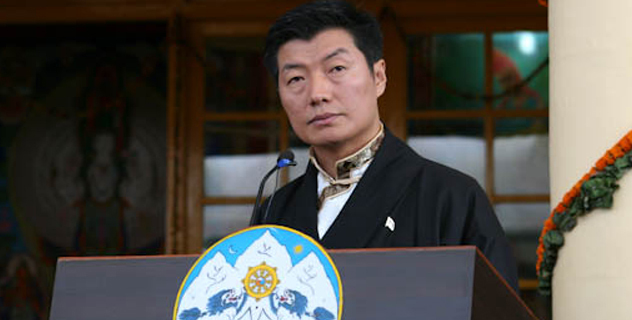 In order to realize genuine autonomy for the Tibetan people, the Task Force, an advisory body to the Kashag, held a conclave in the first week of January to undertake an in-depth discussion on the political developments in Tibet, on issues relating to the future of dialogue with the Chinese leadership and on developments in the larger international political landscape. The Tibetan leadership strongly believes that the only way to resolve the issue of Tibet is through dialogue between the Envoys of His Holiness the Dalai Lama and the representatives of the Chinese leadership. The Envoys of His Holiness the Dalai Lama are ready to engage in dialogue with their Chinese counterpart any time and any place. I am glad to report that within India, we see increasing awareness of the importance of Tibet and more platforms provided for the discussion of the issue of Tibet. There is also the realization that the Central Tibetan Administration is both a genuinely democratic political entity and an effective one. The pride of our democracy is its public participation and we continue to encourage the Tibetan public’s deeper engagement in the democratic process. This year, the Tibetan people and our friends throughout the world will celebrate His Holiness the Dalai Lama’s 80th birthday. On this landmark occasion, we pray for His Holiness the Dalai Lama’s long life and continued good health. The hallmark of the Tibetan people is non-violence, and the values embraced by our elder generation: humility, integrity and resilience which should be embraced by younger generations. This is our political capital as well as political resource. Above all, the first priority of the Kashag is education. In this effort the Kashag encourages Tibetans from all walks of life to be deeply involved in their children’s education. I take this opportunity to thank all our Tibet support groups from Berlin to Brussels and Canberra to Cape Town and from Tokyo to Taipei, in their noble efforts and for supporting justice and freedom for Tibetans. Amid extremism and violent conflicts around the world, Tibet is a model of moderation and non-violence which is worthy of your continued support. We also express our profound gratitude to the people and Government of India for their generosity and hospitality. My fellow Tibetans, once again, and with profound hope and gratitude, on behalf of six million Tibetan people, I offer my sincere prayers for the long life of His Holiness the Great 14th Dalai Lama. Today, we honor and pay our deepest respects to the brave men and women who sacrificed their lives for the cause of Tibet. With enduring spirit, may all Tibetans remain steadfast to the cause our forefathers and mothers, our sisters and brothers, and to all those who have devoted their lives to end the suffering of Tibetans and restore freedom for Tibet. Long live His Holiness the Dalai Lama and Bod Gyalo.